There have been quite a few efforts to harness people power, by putting specially designed energy harvesters in exercise machines, yo-yos, or right inside your shoes. 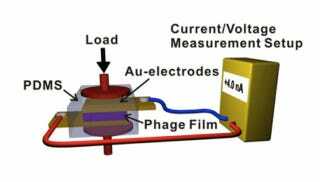 But none of them have been quite as thin or just downright cool as a new device that uses a paper-thin electrode packed with viruses to turn mechanical energy into electricity. The new electrode is a piezoelectric material: it converts of mechanical stress into an accumulation of charge, which can drive electricity. Piezoelectricity is pretty well known—it was discovered in 1880 and is used in devices like electric cigarette lighters and guitar pickups—but the materials used in these devices are toxic and hard to work with. So a few Berkeley National Laboratory and UC Berkeley researchers set out to find a better alternative. Viruses seemed promising because they naturally self-organize, a valuable property when dealing with nanoscale materials that you can't exactly sort by hand. The researchers started working with a virus called M13, which attacks only bacteria and is harmless to humans (a "macrophage") and neatly sorts itself into layers, like matches in a matchbox. After determining that M13 is naturally somewhat piezoelectric, they boosted that property by genetically tweaking it, and then stacked it up into layers 20 viruses thick. When sandwiched between two sheets of gold about one square centimeter (schematic of the device pictured above), the researches could tap on the electrode and produce 400 millivolts, which isn't too bad considering how thin it is. The electrode is far from being ready for commercial release, but as a safe, easy-to-make piezoelectric device that already works well, it shows a lot of promise. In the future, any surface you press on could end up powering your ubiquitous gadgets. I would truly be in a state of technological bliss if my typing could power the very computer I was typing on.